First of all, this is a beautifully fulfilling collection of pieces. Lisitsa’s playing has a warm tenderness and breadth to her phrasing when the music demands it and the strength and speed to accomplish any musical feat in the Scriabin repertoire— and this music is diverse. You may expect the music of one composer in a collection of pieces like this to have a specific affect for the listener, however the experience is like a compilation of composers and styles spanning two hundred years. Unless you are very familiar with every solo work of Bach, Chopin, and perhaps Liszt and Rachmaninoff, many of these pieces will fool you into believing they are actually Bach, Chopin, etc. But there is value here. This is not simply mimicry or music that should be ignored because of its overly academic nature like Chopin’s early opuses— at least when it is presented in a careful manner of ordering and musicality like Lisitsa does so well. Programming is a skill in itself. Performers can breathe new life into music through careful programming of music, especially music that is left separated from a larger grouping of pieces such as album leaves. Releasing an album of all of Scriabin’s opuses in the order they were composed do little good for anyone except for archival purposes. Call me a cynic, but I’m not sure how much we need more releases of the complete Chopin Etudes or the complete Debussy Preludes. Sure, you can be the exception by offering something truly exceptional, but there isn’t much of a demand. 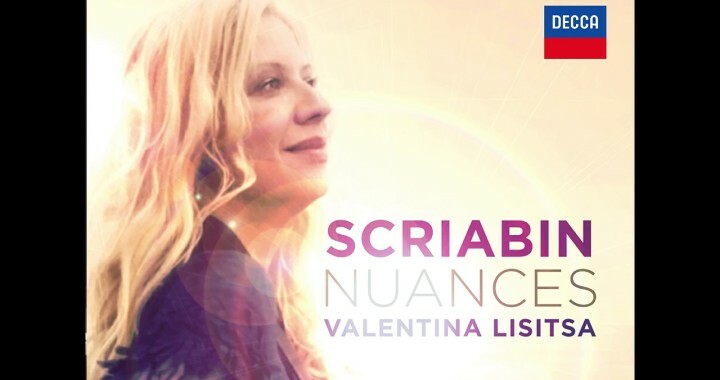 Lisitsa offers us a whole new glimpse into the personality and oeuvre of Scriabin and it is thoroughly enjoyable. Scriabin’s mystic chord. It fits as if completely at home in this piece creating the climax of the work. But if we just listened to this extracted portion it would sound like it may have been taken from one of his more mature preludes when he was deeper in chromaticism. It seems this did not get past Lisitsa and she performs this section as if harkening back to her practices of the later Scriabin. Again, this sets the stage for what is to come in our journey through the works of Scriabin. We take a diversion into some German influences with Klavierstücke and two fugues. To me, these two fugues show little of Scriabin’s character, but help show us more of his influences. I found them less satisfying than those of the Well-Tempered Clavier, but on par with the Bach keyboard fugues separated from those two books. Halfway through the album we begin to settle into the rhythmically and harmonically complex language of Scriabin with the Allegro de Concert and the Poème of opus 41 and 59. These are still less frequently performed works compared to his earlier études, preludes, and sonatas, so Lisitsa’s agenda is very clear to me: a tour through the lesser known solo piano music of Scriabin so we can understand his influences and development. I find it very enjoyable and succinct. I could get a similar taste of this through the exhausting process of listening to all his sonatas, but who has time for that in one sitting? Lisitsa is a pianist with an interesting pedigree. I think of her as sort of the people’s choice of classical pianists. She made her fame from YouTube of all places; but just because she began her road to fame without the need for competitions doesn’t make her any less qualified. In fact, I’ve yet to find a composer or style that she has played that she hasn’t championed. I am happy to round out my collection of Scriabin recordings with her album, and I will continue to listen to this as an album and not just scan my Scriabin archive like I do with the others and cherry-pick a Marc-André Hamelin sonata over a Vladimir Ashkenazy. The only problem is that I doubt this album will continue to pique my interest years (or months) to come. But for a concept album full of B-sides, I am digging it at the moment.